Bulletproof is a 1988 action movie directed by Steve Carver. A clan of terrorists, of all backgrounds and types, seize the "Thunderblast" top-secret super tank, hiding it in Mexico. The task of recovering it is entrusted to "Bulletproof" Frank McBain, a former secret agent and current cop. 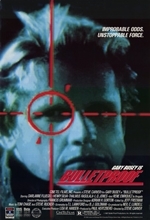 Gary Busey plays McBain, the stereotypical die-hard main character in this film, as he attempts to recover the Thunderblast and his ex-girlfriend.